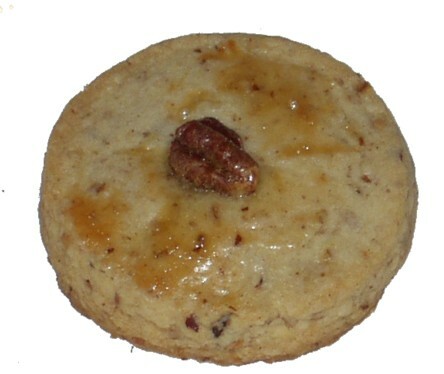 Pecan Sables or Pecan Sandies (Originally from Gourmet Magazine). This is one recipe where European style butter really shines, so if you can score some of the good stuff (Plugra, Lurpak, whatever you like), use it here. Pulse toasted pecans with 2 tablespoons confectioners sugar in a food processor until finely ground. Whisk together flour, salt, and baking powder in a bowl. Halve dough and roll out 1 half between 2 sheets of wax paper until 1/4 inch thick (about a 9-inch round). Cut out as many rounds as possible with a cookie cutter and arrange about 2 inches apart on baking sheet. Roll out scraps and cut remaining dough in same manner.